Shortly before 8 am on 16 March 1968, C Company, 1st Battalion, 20th Regiment, 11th Brigade, Americal Division, on a search-and-destroy mission in Quang Ngai Province, South Vietnam, entered the hamlet of My Lai. By noon more than 400 women, children and old men had been systematically murdered. To this day, the My Lai massacre has remained the most shocking episode of the Vietnam War. Yet this infamous incident was not an exception or aberration. 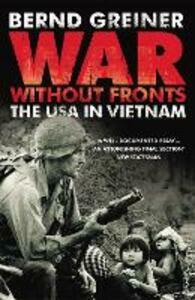 Based on extensive research and unprecedented access to US Army archives, and tracing the responsibility for these atrocities all the way up to the White House and the Pentagon, War Without Fronts reveals the true extent of war crimes committed by American troops in Vietnam and how a war to win hearts and minds soon became a war against civilians.